Tonight is the night many of you have been waiting for! Across the country more than 500 movie theaters will broadcast the DCI World Championship live from Lucas Oil Stadium in Indianapolis. The start of the competition for the 2016 DCI Founders Trophy will feature the top-15 World Class corps in this 13[sup]th[/sup] annual one-night cinema event. 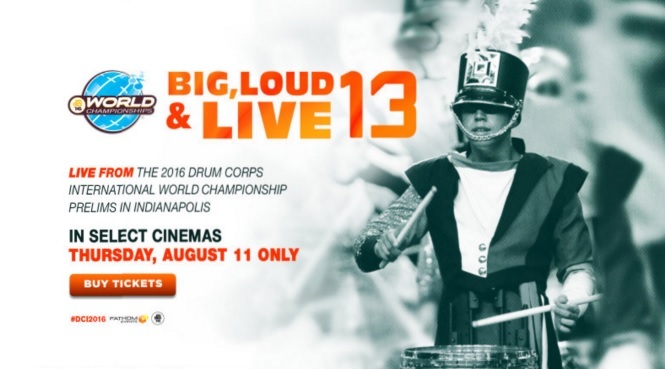 “Big, Loud, & Live 13” will hit the big screen at 6:30 p.m. ET/ 5:30 CT/ 4:30 MT/ and 3:30 p.m.
Tickets for the event cost $18 but may vary by theater location. Tickets are available for purchase at participating theater box offices and through FathomEvents.com. Tell your parents to grab tickets and get to the theater tonight!